• Sap-nikla forest, located 22 km from Islampur where visitors can visit the lake and forest for sight seeing. The headquarters of the Uttar Dinajpur district, Raiganj is a municipal town since 1951 and one of the major trade centers in North Bengal having National Highway-34 passing through it. Raiganj is 425 km from Kolkata and 181kms from Siliguri. The Kulik Bird Sanctuary is principal attraction of Raiganj. The vast and beautiful swamp land on the bank of a small river named Kulik provides home to thousands of migratory birds including Open-Billed Storks, Night Herons, Egrets and Cormorants and indigenous birds as well. The sanctuary at Kulik draws thousands of tourists every year to Raiganj. Raiganj Bird Sanctuary is located along the National Highway and lies beside the Kulik River covering an area of 35 acres. It is the second largest bird sanctuary in Asia where migratory birds like open-bill storks, night-herons, cormorants and egrets coming from South Asian countries and coastal areas hang around. Here you can also find local birds like bulbul, kingfisher, dove, sparrow, woodpeckers and many other species foraging for food and shelter. Islampur AREA: 343 Sq. KM POPULATION: 27, 00,000 approx. Islampur is a small town in the district of North Dinajpur, located 110 km from Raiganj. The town primarily consists of a Muslim population, which is almost 98 per cent. The rivers of old Brahmaputra and Yamuna flow through the region. 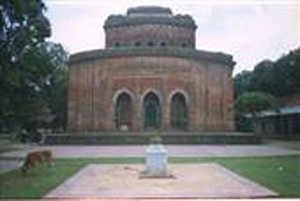 Archeological sites consist of the tomb of Hazrat Shah Kamal at Durmuth and war memorial at Musharafganj.